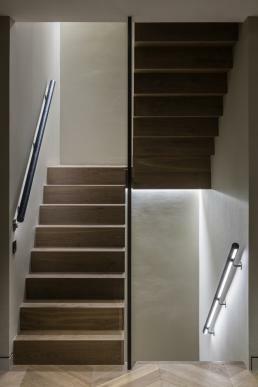 Five flights of bespoke cantilevered stair in folded steel clad in oak. As part of a major extension to this private home, Cake Industries were commissioned to build an impressive feature staircase running from double basement level to third floor. 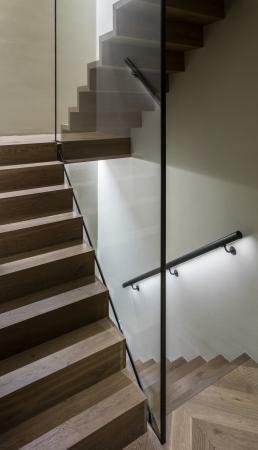 Tied together with large floating glass balustrades the staircase is visible from all angles as well as from underneath. 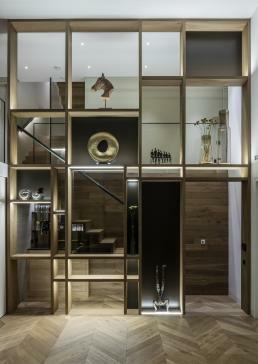 Particular attention was paid to ensure that there are no visible fixings. In the controlled environment of our workshop, the oak flooring was used to clad the steel in mitred, single-plank treads with the outside edges solid nosed in a 45 degree pattern to reflect the herringbone parquet. The flights were delivered to site for installation by the main contractor as completed units so that the flooring could run into them at their precise floor spacings.